The GLUE stand at the VFX Summit Dublin 2013 in the Science Gallery. Irelands VFX and Animation Event November 29 / 30, 2013. It was a great success, met some amazing talent from the visual effects world, some fantastic talks featuring breakdowns from some major films including Man of Steel and of course Gravity which opened the Summit Friday night. 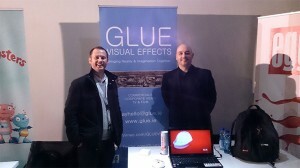 Here’s a pic of Ray and Richard at the GLUE stand. Thanks for the photo Paul.